Win hearts with these fresh designs! Valentine’s Day is my favorite holiday–there’s just something about a day dedicated to love that makes me feel like creating something special to show my loved ones how much I care. I also love decorating my home with hearts, loads of them, everywhere. I’m a romantic, after all. 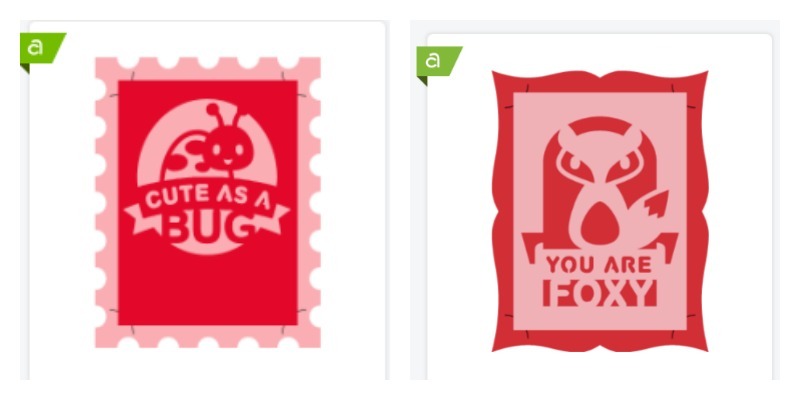 So, it shouldn’t surprise you that the Cricut content team has been working like mad to make sure YOU have the BEST Valentine images to use in your creations. We’ve added everything from phrases to 3D objects to cards. Many of the images are a single layer which is perfect for vinyl and iron-on projects. But, never fear, we also have layered paper images and 3D projects for paper artists out there. Take a look and be sure to let us know in the comments section what images you are loving! This set is a mixture of layered paper phrases and vinyl designs. My favorite are the layered paper images like “You Rock My World” (#MA56B140) or “Hugs & Kisses (#MA56B1E7). Any of these designs would be very simple to layer on top of a card base or as a gift topper. Beautiful images to communicate your love story, whether that be with your significant other, your pet, or yourself. I love that many of these phrases have a masculine feel to them – very different from our usual feminine, script designs. Awww, these images seriously melt my heart. We’ve created a vinyl/iron-on and paper version of each animal. I can’t decide whether the penguins or the elephants are my favorite. Which one do you like best? These Valentine’s phrases are perfect for a wooden sign or to apply to the front of a card with vinyl. Do you have a little one in your life that needs a shirt for Valentine’s Day? This set is for you. It’s full of iron-on designs perfect for making custom t-shirts. This set has three options for each image: vinyl/iron-on, layered paper, and card design. Whichever version you choose, we hope you find your Punny Valentine. With all of the newness we’ve been adding to Cricut Access, I think we tend to forget about some of the amazing images from a few years ago. I thought I’d share my favorite oldies but goldies! These one-cut cards are PERFECT for kids Valentine’s because they are adorable and require NO glue to assemble! Simply slip the front piece into the slots on the back piece! This was one of our original Valentine phrase sets and it still has some lovely images to help you this holiday. There are even drawing features to add to your paper designs. Honey, wine is my valentine, too. This set has some quirky phrases and images perfect for a custom t-shirt. Have you ever tried to build a 3D paper project? Now’s your chance! Love is in the Air is full of some beautiful paper designs. There’s even a 3D countdown to Valentine’s day complete with 14 tiny drawers. Best of all? We have a digital assembly guide to walk you through each project! Download the Assembly Guide: Click Here. How adorable would it be to make 3D mailboxes for your kids this year? They would probably LOVE it! Love Struck has some amazing iron-on images as well as 3D paper options. I love using my Cricut to add hand-drawn sentiments without actually having to bare my own handwriting to the world! Love Note Sentiments is full of draw-only images to add to your Valentine’s this year. I could go on and on. I LOVE our content library, can you tell? From the content team, we wish you a very Happy Valentine’s Day.